^ "Fort Knox Partners". www.knox.army.mil. Retrieved 10 August 2018. ^ "The Official Homepage of First Army Division East". www.first.army.mil. Retrieved 10 August 2018. ^ "First Army - 4th Cavalry Brigade". www.first.army.mil. Retrieved 10 August 2018. ^ "About USAMEB". goarmy.com. Retrieved 10 August 2018. 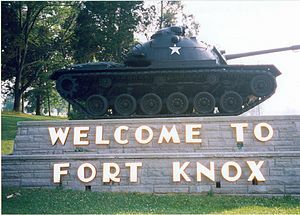 ^ "19th Engineer Battalion - Fort Knox, Kentucky". www.knox.army.mil. Retrieved 10 August 2018. ^ "1st Sustainment Command (Theatre)". www.knox.army.mil. Retrieved 10 August 2018. ^ "902d Military Intelligence Group - Fort Knox, Kentucky". www.knox.army.mil. Retrieved 10 August 2018. ^ "The United States Army | U.S. Army Cadet Command". www.cadetcommand.army.mil. Retrieved 10 August 2018. ^ "United States Army Recruiting Command (USAREC)". www.usarec.army.mil. Retrieved 10 August 2018. ^ "100th TD (LD)". www.usar.army.mil. Retrieved 10 August 2018. ^ "Aviation Command". www.usar.army.mil. Retrieved 10 August 2018. ^ "84th TNG CMD". www.usar.army.mil. Retrieved 10 August 2018. ^ "83rd USARRTC". www.usar.army.mil. Retrieved 10 August 2018. This page was last edited on 15 April 2019, at 08:10 (UTC).